Power pools gave some hopeful teams shots at top ranked North American clubs. After three days of competition in the men’s division here in Cincinnati, OH, the field has dwindled from 32 teams to just 24 that have advanced to bracket play. Each team still in contention played two power pool games either fighting for a bye into the round of 16 in the upper power pools or for a spot in the round of 32 for the lower power pools. As the sun sets here, only four teams are still standing with undefeated records: Revolver (USA), Doublewide (USA), Ring of Fire (USA), and GOAT (CAN). But this was the first day that all of these four teams faced significant adversity. In their final game of the day, GOAT played a remarkable one break game against Colony (AUS). Marijo Zlatic hauled in a pass from Alec Arsenault to take a 4-3 lead for Toronto and then the rest of the game was offensive hold after offensive hold all the way through double game point. Colony had its best chance to get a break back at 11-10, but after many turnovers and a GOAT timeout call, they couldn’t punch in the marathon point. Ring of Fire faced the best Europe has to offer, facing off against Clapham (GBR) and CUSB (ITA) in succession on the livestream. In their game against the Londoners, they surrendered just a single break, and while Clapham was able to match their deep game during the first half, a 3-0 run out of halftime left Clapham playing more conservatively. The Brits were never able to apply the same defensive pressure and Ring took the victory 15-11. CUSB fell behind early and, after giving up a 3-0 run out of half, found themselves down 11-5. A few late breaks gave the Italians hope, but a throwaway by their D-line offense halted their run, leaving Ring with a 15-12 win. In Pool J, General Strike (CAN) and Doublewide manhandled Chevron Action Flash (GBR) and Juggernaut (AUS), respectively. Both of the losing teams’ physical style was rendered ineffective by the superior skill of the North Americans. General Strike and Doublewide then went to blows for the pool. Mark Lloyd was again sidelined for the entire day with a foot injury with plans of resting up for bracket play tomorrow. Nonetheless, General Strike was within two points until a Kurt Gibson goal was undercut by a late hit from a Canadian defender, who Gibson spiked the disc over. This sparked a two break run that put the game out of reach for Winnipeg. Tomorrow morning, teams from the bottom two spots in the upper power pools will face off against the top two teams from each of the lower power pools in a play in game to the round of 16. In the afternoon, the winners of those games will take on the top teams from the upper power pools in a straight 16 team bracket with one round on each of tomorrow, Thursday, Friday, and then, championship Saturday. The best is yet to come. 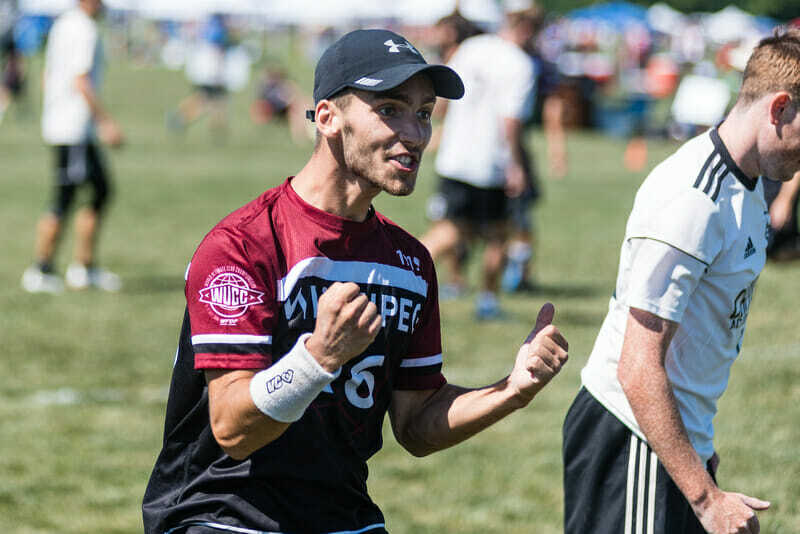 Comments on "WUCC 2018: Tuesday Recap (Men’s)"